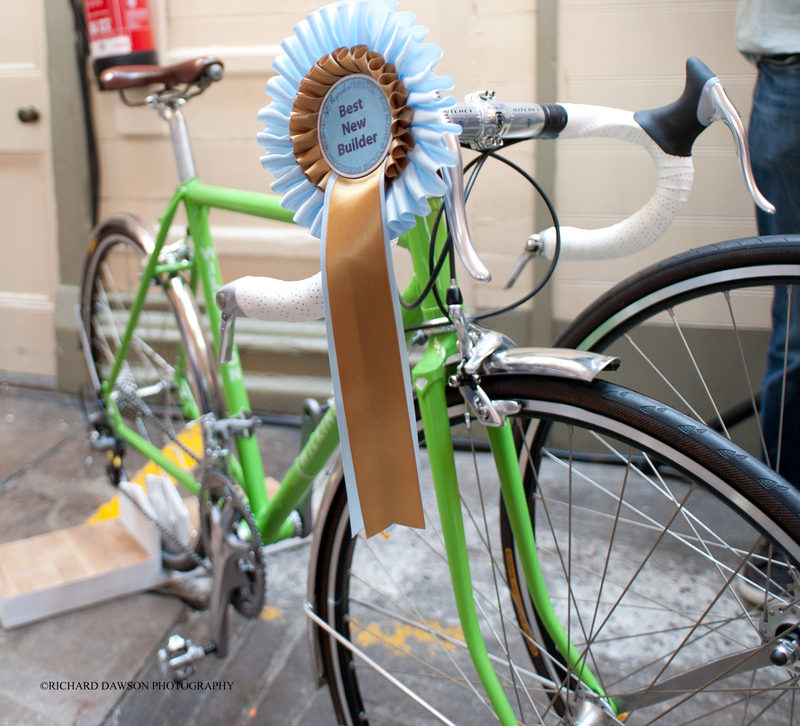 Bespoked Bristol, now in its second year, is the UK’s premier Handmade Bicycle Show. Now based in the Brunel’s Old Station in the centre of Bristol. The show brings together the best bike designer and manufactures in the world. This year’s show had exhibitors from the UK, Italy, France, USA and Germany. The idea to own something unique and hand crafted with excepitional attention to detail will always be a niche market. But having said that it is a growing market that more and more people are prepared to pay for. These craftsmen are scattered all over the UK in small garages and workshops. Some come from engineering backgrounds where they can apply their skills, other get into it because of their love for crafting something unique and beautiful. The traditional steel frame has the look and feel of ‘yester year’. 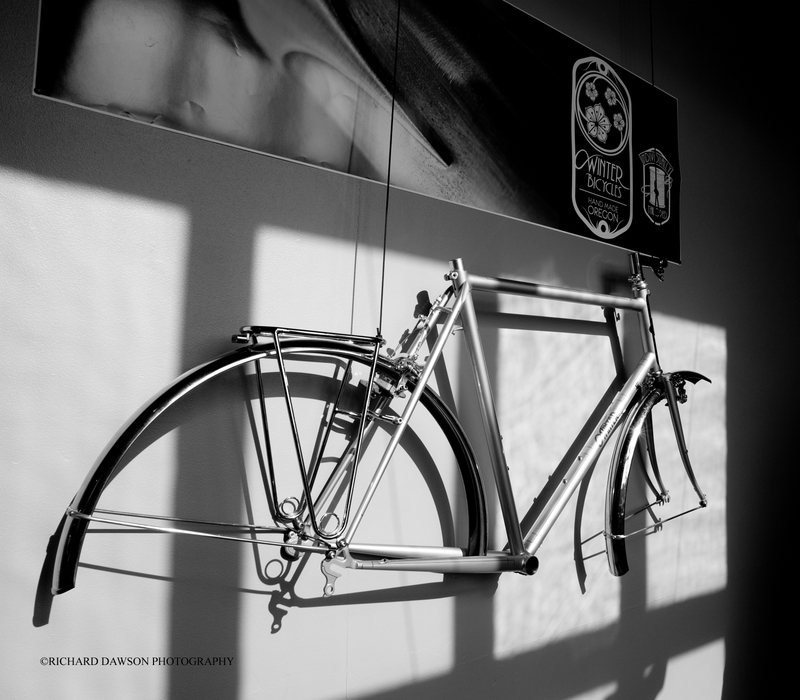 The mass produced modern frame made from Aluminium and carbon are the mainstay of bike production. The vast majority being made in the Far East have an almost ‘sterile’ look about them. Indeed some of these bike manufacturers made their frame for different bike firms who then applied their own stickers to them. Custom made bikes which will ‘fit you like a glove’ can be purchased for a lot less money than some mass produced frames in traditional bike shops. Another key difference is that it will be designed to your exact specifications. The ‘buying process’ is something to enjoy, compared to internet shopping. Talking to the person who is going to craft your new ‘stead’, seeing the tools and material laying in their workshop is what this is all about. Visting ‘Bespoked Bristol’ this year, it is clear that business is booming. Over 70 exhibitors packed the Brunel’s Old Station, ideally located right next to Bristol Temple Mead Railway Station. There was already a queue waiting patiently outside for the doors to open at 0930 on Saturday morning. It was nice to see an area for ‘new builders’. Matthew Wilkinson won the “Best New Builder’ award. Matthew worked as a London cycle courier and was awarded, in 2011, a travelling fellowship from the Winston Churchill Memorial Trust. He visited the USA where he met with frame builders in nine states, and investigated the skills, equipment and techniques involved in making quality steel bike frames. Since returning to London he has set up his own workshop whilst working as a brazer at Brompton Bicycle Ltd.
Another builder who has a growing following is Robin Mather. He started building bikes in the early 1990’s and began with a recumbent tricycle, for an A level project. Cyclist spend plenty of time ‘tinkering’ with their bikes and what started as a pastime slowly turned into a full time job. Robin is mostly self taught but did spend time with Dave Yates, well known frame builder. His latest creation for the Bespoked show , ‘Camponneur’ won “Best in Show” “Each bike takes about 60hours to make” says Robin, “I like to take my time, I don’t have many commitments so I am able to work at a pace that suits me” added Robin. What stand out with his bikes is the attention to detail and their practicality. 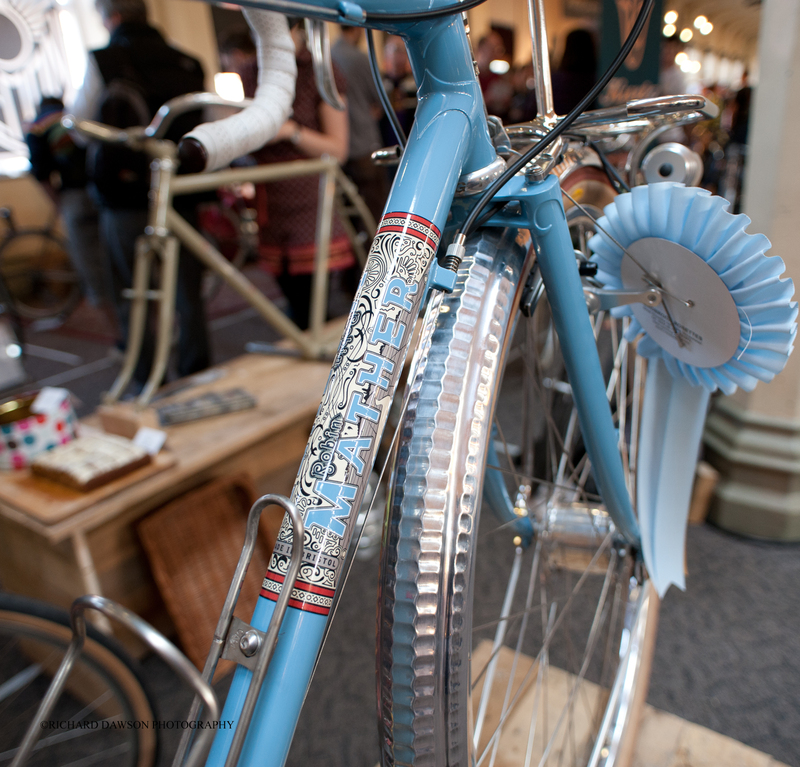 A first time exhibitor at the show was capped off with the ‘Public Vote’ for Best In Show. He currently has a 8 month waiting list. The show is not all about bikes and frames. There were business like Velo-re. Founded in 2006 with the idea that tyres can be “tired”, but don’t have to retire. 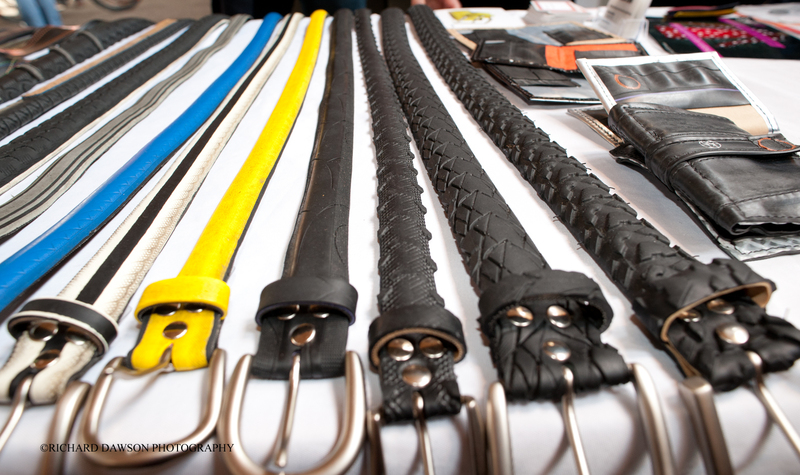 Originally set up as part of a bicycle recycling project in Berne, Switzerland, Velo-re handcrafts belts made from recycled bicycle tyres and inner tubes. The old saying one man’s rubbish is another man’s treasure, is true. The quirky nature of these belts together with the ‘recycling’ are their unique selling point. Each tyre wears differently according to its rubber compound and whether it has been used on road, track or cross country. They have expanded their product range to include wallets and travel card holders which are made from recycled rubber. Dani Foffa was building fixed gear bikes in his East London flat, while working full time in the City. Two years later he quit his job and together with photographer Tyson Sadlo created Foffa Bikes. Along with the original ‘Prima’ singlespeed bike, which is available in eight different colours and a reputed eight million build options when taking into account component choices, the company has developed it’s own unique frame design.They are also expanding on Foffa’s ‘Build a Bike‘ online configurator so you will be able to adorn your fixie with custom artwork from a large catalogue of designs. Be aware the ‘Build a Bike‘ configurator is additive! “The sticker range is how we want people to take customisation to the next level. The stickers are relatively easy to apply, hard wearing and waterproof as well.” Says Dani. In a very short time Foffa bikes has built not only a solid business but a very strong brand. Bespoked Bristol has shown that here in the UK we have an abundance of skilled craftsmen. While it might not be everyones cup of tea, I think judging by the number of people who attended and the quality of products on show the handcrafted bicycle is here to stay.